Two of Labour’s most senior figures have clashed over how to handle anti-Semitism within the party. 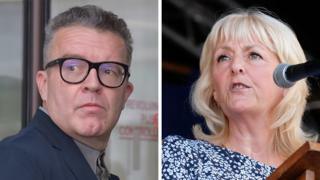 General secretary Jennie Formby accused deputy leader Tom Watson of “completely unacceptable” behaviour for asking that complaints about anti-Semitism be forwarded to him for monitoring. She said his approach would “undermine” and “pollute” existing party processes. Mr Watson stood by his request, saying “opacity and delay” by the party had led to “a complete loss of trust”. The Labour Party has been dealing with complaints of anti-Semitism over the last two years. Mr Watson’s original intervention came after nine MPs quit the Labour Party last month citing the party’s failure to tackle anti-Semitism as one of the reasons. Mr Watson emailed all Labour MPs and peers telling them he would be “logging and monitoring” complaints of anti-Semitic abuse and bullying. Ms Formby then wrote to him, copying in all Labour parliamentarians. Ms Formby said that he and the party had “very strict responsibilities” to safeguard members’ data under GPDR and data protection laws and asked for complaints not to be sent to Mr Watson “or any unauthorised individual”. Mr Watson responded: “The constant concern of those complaining about anti-Semitism in our party is that there is no transparency about the process. “Too often those who have suffered anti-Semitic abuse have not heard anything about the outcome of their complaint. “It is my responsibility as deputy leader of the Labour Party to ensure people have confidence in our complaints system and our ability to deal transparently with the scourge of anti-Semitism. She said the current complaints system had a “huge amount of trust to rebuild”, and that too many complaints “just seem to disappear”. It comes as members in Diane Abbott’s Hackney North constituency issued a motion against MPs who “slander the party” by claiming it is “institutionally anti-Semitic”. Labour’s Stella Creasy, who represents the neighbouring London constituency of Walthamstow, said the motion was “disgraceful” and called on Ms Formby to investigate the local party. Sheffield Hallam members backed a similar motion and called for the reinstatement of MP Chris Williamson, who was suspended by the party last week for saying Labour had “given too much ground” in the face of criticism over anti-Semitism. Brent councillor Neil Nerva, a member of the Jewish Labour Movement, said colleagues at the meeting in Hackney North had said shadow home secretary Ms Abbott was present. Ms Abbott has not responded to questions about the meeting.